The Historic Landscape Characterisation Dataset captures the history of the landscape of the North Wessex Downs not just across its open downlands, river valleys, heaths and common lands but in the successive layers of human activity which have been imprinted into the landscape. Capturing this timedepth allows us to peal back these layers to understand how the landscape we see today has evolved. This understanding allows us to understand the shapes of the fields, the locations of the woodlands, the history of the parkland and the growth of its settlements. This can be combined with archaeological information contained within the county Historic Environment Records to provide a complete overview of human land use and activity in the North Wessex Downs AONB. This map is therefore our top layer. It shows where there has been some kind of 20th century activity which has modified or changed the North Wessex Downs AONB landscape. It also shows other areas left untouched and therefore surviving as intact examples of C19th, C18th, C17th, C16th or even Medieval landscapes. 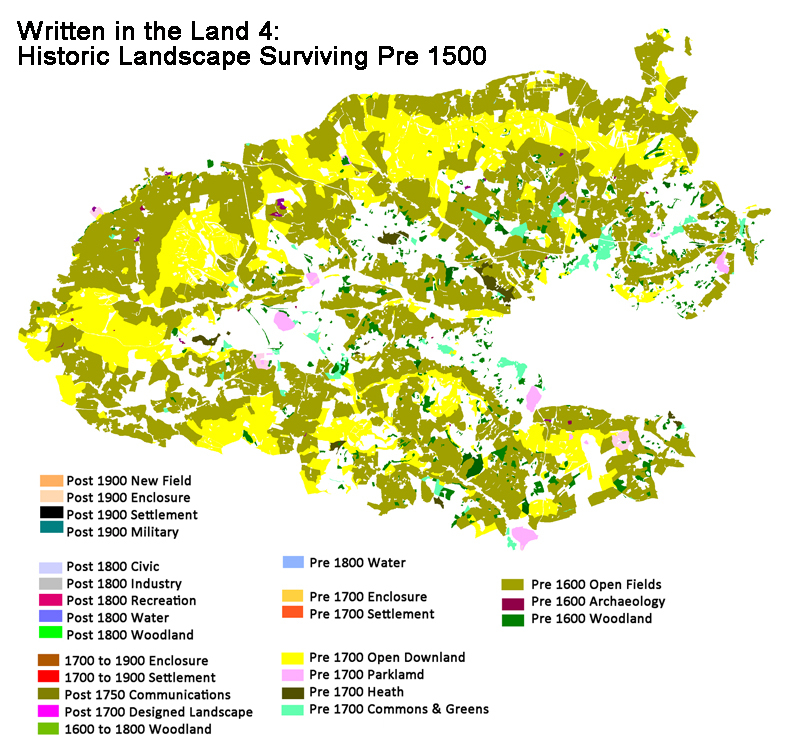 As can be seen the majority of activity "Post 1900 Enclosure" has modified existing fieldscapes through reoganisation, amalgamation or subdivision of field boundaries. 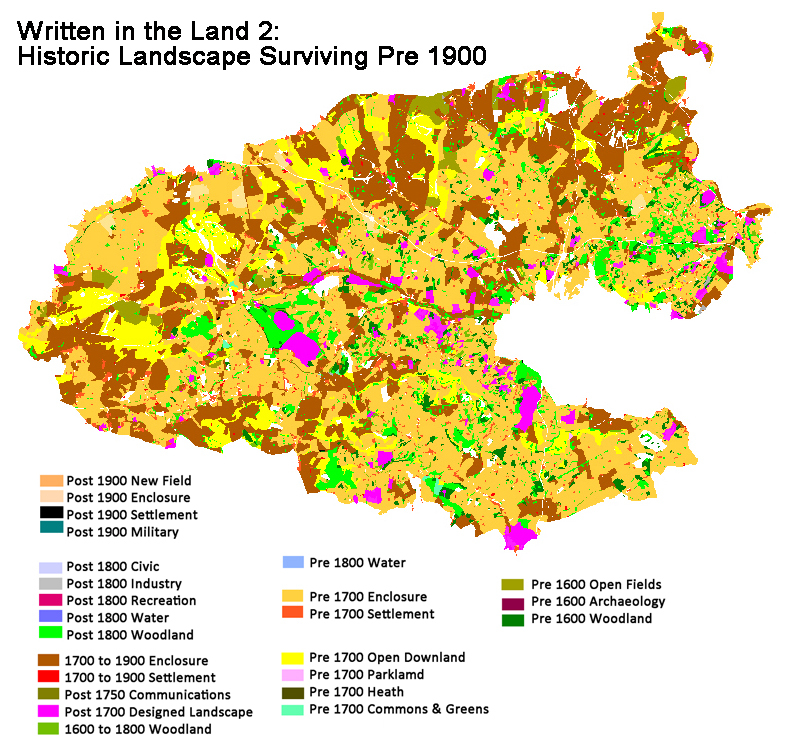 Note the "1900 New Fields" created by enclosing formerly Open Downland in the western half of the AONB. As we will see much of this activity preserves traces of earlier land use beneath it. 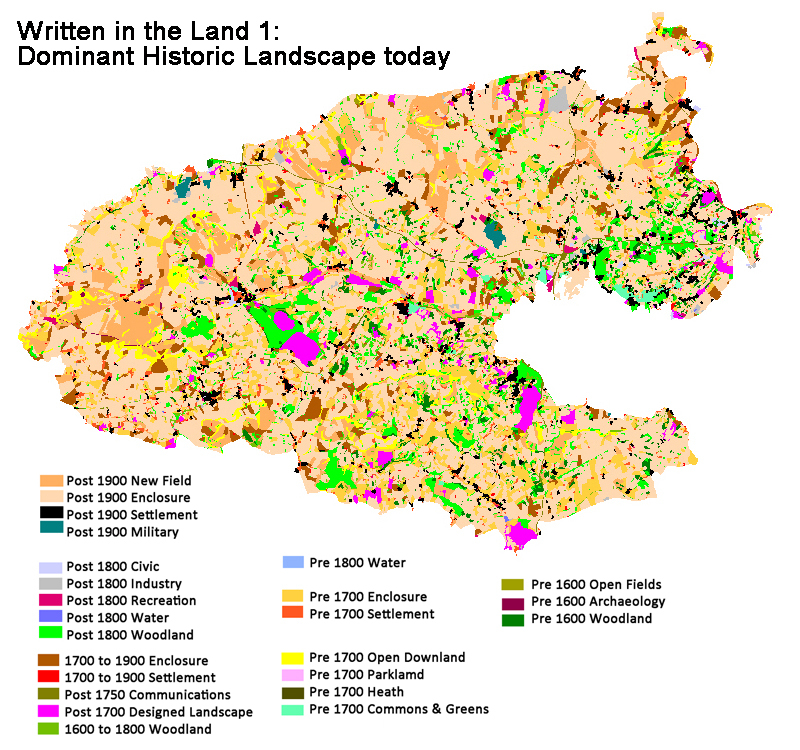 However some kinds of 20th century activity have removed or obscured earlier land use patterns for example the construction of Military bases or the creation of 20th century housing estates. Removing the influence of human activity we can see that over 95% of the AONB retains traces of earlier land use. 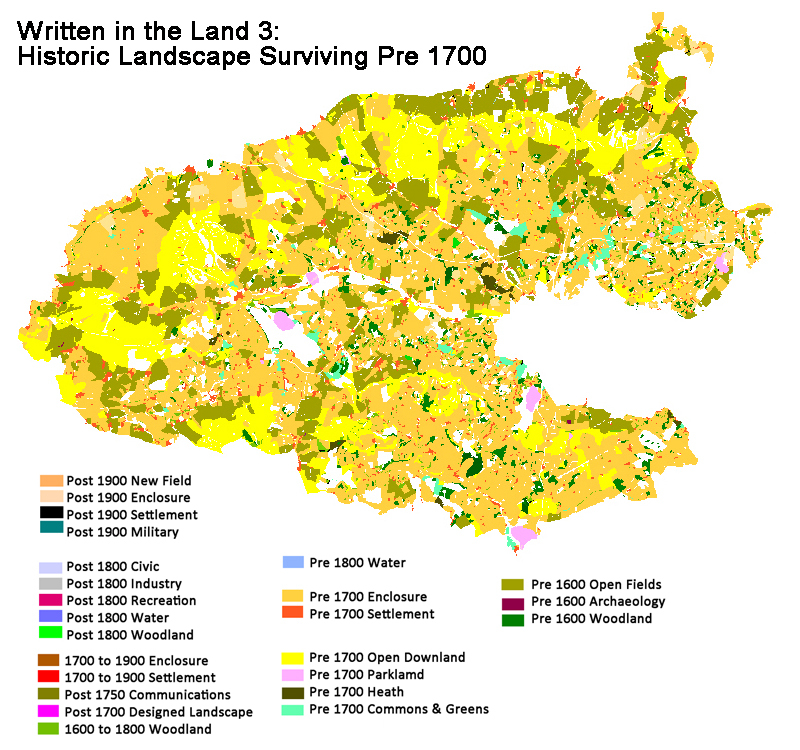 The division between 1700 to 1900 enclosure and pre 1700 earlier piecemeal enclosure in tan can be clearly seen. The extent of open chalk downland in yellow as a band across the north of the AONB can also be seen. Other notable features are the pattern of designed parkland surrounded by Woodland dating to after 1600. If you look closely at the dark orange dots you can make out the pre 1900 settlement pattern, lines of settlement along valley bottoms can be made out in the west and south of the AONB and the distinctive pattern of dispersed settlement in the east of the AONB. Traces of formerly open chalk downland can be seen in yellow in bands across the AONB surrounded by formerly open 1600 open fields. The extent of Post Medieval enclosure can be seen in tan representing the adhoc enclosure of previous open land. The distinctive pattern of commons, greens and heaths and dispersed settlement can also be seen on the eastern side of the AONB. in the east of the AONB a Medieval landscape characterised by small fields and dispersed small settlements and farms, inter-related with large commons and woods with a dense network of roads and tracks. The interplay of land-use, roads and the axes of the ridges and valleys created a very irregular grain to the landscape. This picture of course needs to be complemented with information from the Archaeological record, this also helps us to dive further back in time.